Much more than business centers. We are a community of companies and entrepreneurs who share experiences in Barcelona. Our workspaces and meeting rooms are designed to make people creative, build and grow. Your project is our priority. Spaces that project your creativity. If you are looking for an incredible workspace or you need a unique place to hold meetings or events in Barcelona, come and visit us. We firmly believe in personalized treatment, adapted to your needs. We want to show you our spaces and introduce you to our partners. We would also like to know your project or company, and share our experiences with a cup of tea or coffee. WEKOW Community Reviews Visit this page to see all opinions about WEKOW. I have been in Wekow for 4 months and from the first moment I felt very comfortable, they are very attentive to that you have the best benefits and the truth is a very wide site and it works great. I appreciate the treatment that you give me! So it's nice to go to work! Great light, excellent level of cleaning and maintenance, and good roll is what make this coworking space probably one of the best in the city of Barcelona. We can not imagine a better place to develop your work day! reat coworking. Modern, quiet, spacious. No complaints and the boss even better, previous comment was not fair with her. Recommended is little. A spacious, very pleasant, well equipped and very professional Business Space, located on a typical floor of the ensanche, tastefully restored. Ideal for teams and professional meetings in the center of Barcelona. Led by a great team and the "touch" of Montse. Multipurpose spaces. Professionalism and sympathy everywhere. Highly recommended. It seems to me a great space, a privileged and historical environment, an ideal service and environment to work, meetings, events and workshops. Maximum professionalism of the company. I plan to return many times and recommend it whenever I can. 100% recommendable! An incredible co-working space located in the heart of Barcelona. The community, which is run by Montse Puyoles, conveys a sense of optimism and support that will make you feel part of a team, even if you work on your own. You get your own meeting room, which can also serve as a relaxed place to have a chat or a meal or, in my case, as a beautiful showroom! Unbeatable location for your office, as well as for meetings or events. The rooms are bright, comfortable and beautiful. The office is housed in an old building that has been beautifully restored and equipped with all facilities necessary to ensure you are comfortable at work. I recommend it. I love having my office at Wekow. Everything is fantastic and perfect! The location is in the centre of Barcelona, the workspace, which is in a wonderful modernist building that has been revamped with a modern and very tasteful design, the environment, your work colleagues, the attentive hospitality of the director and the energy that you breathe in. You cannot ask for more from a co-working space. 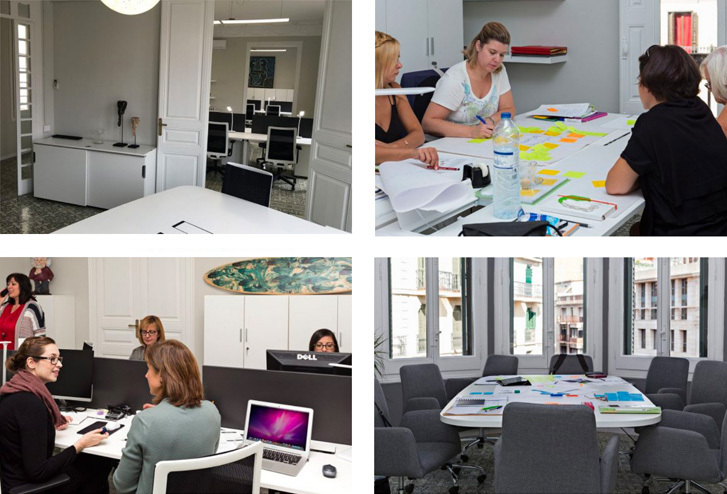 Located in the centre of Barcelona, it is a pleasant environment created by people who give you energy to keep on working and have a willingness to help that is hard to find anywhere else. If you are looking for more than just a co-working space, this is the place for you! I have been to offices in different countries in Europe AND also previously in Barcelona, but no place matches this place. Great office, great location og most importantly great prices! Everything was perfect from start to finish and the host was very professional and nice to us. I will definitely recommend trying this office! We send from two to three newsletter a month. Our newsletter is bilingual, in Spanish and English. You can unsubscribe whenever you want from the newsletter itself. We do not sell, lease or rent our e- mail subscriber lists to third parties.